Are you a player from the UK looking for some serious casino entertainment? Then you should head over to the well-known and popular British online casino called Bgo. 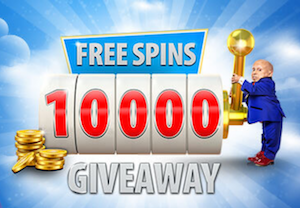 Right now the casino’s very own mascot, Verne Troyer, aka Mini Me is throwing a great giveaway with none the less but 10 000 free spins up for grabs. If you want a chance to claim some of the bonus spins you’ll have to log in or sign up at Bgo now! There’s no time to waste anymore. We can also tell you about a generous bonus that you can use in Bgo’s live casino this month! The boss at Bgo is rather generous this January. One of four weeks ended last Thursday and the second week is up and running until tomorrow, the 19th of January. If you want to join the last two weeks of the promotion all you have to do is log in at Bgo and opt-in and wager £10 on any of the selected videoslots which are Wonder Woman Gold, Dolphin Gold, Diamond Wild and Cleopatra Plus. Then you will receive a ticket. For every £10 you wager on any of these games you will earn a ticket and you can collect as many as you’d like. The team at Bgo will draw 100 winners each week that will get to share none the less but 2500 free spins that can be used on any of the videoslots Starburst, Aloha! Cluster Pays, Drive and Pyramid: Quest for Immortality. Week number three starts on Friday the 20th and will go on until the 26th. After that there will be a fourth and last week between the 27th of January and the 2nd of February. Keep in mind that there’s a wager requirement of x35 on your winnings from free spins at Bgo. If you want to enjoy yourself at Bgo’s live casino you can join a special promo until the 2nd of February. Every day between Sunday and Thursday you will be able to get 50% extra up to £50 per day. Don’t forget to enter the special bonus code LIVE50 when you make every deposit in order to qualify for this offer. You can only use this bonus at four different classic tables. These are Live Black Jack, live Roulette, live HI-LO and Live Baccarat. You will have to deposit at least £10 in order to get the bonus and there’s also a wagering requirement connected to this bonus and it is set to x50.